Antony Gormley is one of the most famous sculptors to come out of Britain in the 21st Century. There are many of his artworks dotted around his alma mater city, but in 2018 he is returning in full force to Cambridge after studying at the university 47 years ago. He presents his latest site-specific exhibition, SUBJECT, which has been specifically designed for Kettle’s Yard, and explores the spaces of its recently refurbished gallery. Space – and the human body in space - is a very important theme of Gormley’s oeuvre, and he has taken it into special consideration in SUBJECT, having collaborated with architect Jamie Fobert to give as much attention to where he presents his sculptures as to what is presented. With only 5 works in total, each piece is given scope to “breathe”, and establish itself within the gallery’s slick, modern interior. This sense of spaciousness, turning the gallery into a vast white void, creates a very calming effect, but also encourages spectators to consider themselves within their environment, and in relationship to the sculptures on display, so that they almost become part of the art work themselves. The first sculpture visitors encounter is Co-ordinate IV (2018) which is comprised of two taught steel rods that pierce through the gallery’s airspace. Running through the entrance area, Gallery 2 and the Sackler Gallery, Coordinate IV pleasingly creates a sense of continuity throughout the exhibition. Its expansive nature also means it can be viewed from various angles; it’s advisable to stand at the end of one rod and gaze down it, so it appears to have no end, and stretches out into infinity. Gormley is of course best known for his depictions of the human form, many of which are cast from his own body. It is therefore exciting to see Edge III (2012) as a testament to the process for which he is renowned, and also for its gravity defying position. The solid mass of iron seems to hover in space as it is attached at 90 degrees to the wall – a feat we are informed required the consultation of various structural engineers! The eponymous Subject (2018) is another reflection of the human form, yet this sculpture is composed of steel bars giving a pixelated effect, perhaps a comment on the modern computerized age. The figure stands alone and isolated, pensively facing out towards the window and the streets of Cambridge. Despite his street view, his head is curved down towards the floor, giving the work a melancholy resonance. For dance enthusiasts, it is impossible not to view Edge III and Subject without being reminded of the two dummies he produced as props for choreographers Akram Khan and Sidi Larbi Cherkaoui’s 2005 work Zero Degrees. Working with dancers was an obvious decision for Gormley, as his concern with the body’s relationship with space manifests itself in dance like no other artform. You can learn more about Gormley’s collaborations with choreographers in the insightful BBC Documentary about his work that is screened every Thursday and Sunday in the Ede Room. 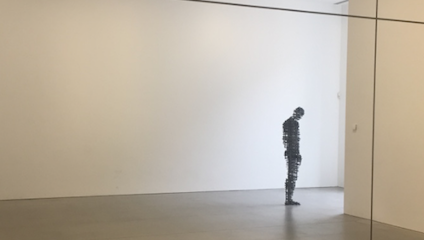 Or, if you’re quick, you can catch dance company Casson & Friends on 28 July, for the performance of their latest piece inspired by Gormley’s exhibition. Despite Gormley’s renown for the human figure, the standout work of the exhibition is something a little different. Isolated in the Edlis Neeson Research Space, Infinite Cube II (2018) provides the only light source in the room. A glass cube of LED lights that radiate and form tunnels of light that morph as you move around the sculpture, Infinite Cube was inspired by and created in memory of Gormley’s friend Gabriel Mitchell, a mathematician with whom Gormley discussed concepts such as infinity. There’s lots more to see at Kettle’s Yard after exploring the stark, white world of SUBJECT, namely Kettle’s Yard House, which was left to Cambridge University by Jim and Helen Ede who lived there between 1958 and 1973, and wanted to continue to share their extensive art collection with the public, and profess to people the benefits of “living with art”. Jim was a onetime curator at the Tate Gallery in London, and amongst his private acquisitions is a beautiful Miro he picked up in Paris for around the price of a cup of coffee! The most charming thing about visiting the house is that it is left as a domestic environment (a far cry from the ethereal otherworldly feeling of SUBJECT), and you can meander through, and even gaze at art works in the bathroom next to the toilet bowl!